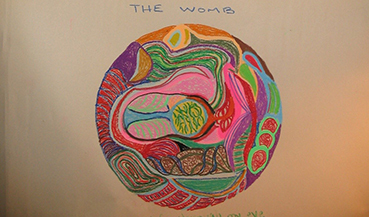 womb is the cavas whereon she painteth her pictures"
~ Composing a "womb song"
Self-expression and creativity are manifestations of our true humanity and as such will be revealed through the sessions, paralleling the creation unfolding in the woman’s body. Re-awakening and stimulating the imagination is an important and ongoing part of this work. Each session will include live music that is improvised by the parents and the music therapist. You need not have had previous musical training or to be a musician to participate and enjoy this experience.